Where:: Near Jackman, ME (carpooling to be organized prior to the workshop). When: 2020 dates will be announced in the fail of 2019! Send a message to office@vermontwildernessschool.org to get notified when registration opens. Ages: Adults and motivated teenagers. Cost: $410 – 575 sliding scale. (The true cost is $500 per participant.) Cost includes cabin lodging and instruction. Participants bring own breakfast and lunch, and contribute to potluck dinners. Join Vermont Wilderness School for a long weekend on the trail of one of the most elusive carnivores of the Northeast. 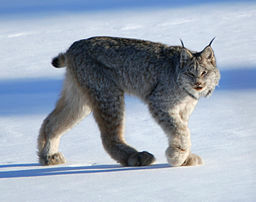 The Canada Lynx is built for deep snows, long winters, and big wilderness – all found in the vast lands of Northern Maine. 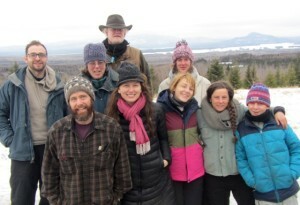 We will spend the weekend together tracking, trailing, learning winter ecology, and building connection with the grey ghost of the North! Led by experienced VWS instructor Bob Etzweiler (Registered Maine Guide) and special guest Michelle Van Naerssen of Wilderness Awareness School in Washington state. We’ll also meet with some local guides/ trackers to learn about wildlife populations, forest management, and some of the issues facing by the community of Jackman. Evenings are spent around the fire in our cabins, where we’ll share meals and stories of the day. Read Bob Etzweiler’s reflections on the 2015 trip. Pay in full, or pay a $150 (non-refundable) deposit. Complete a Medical Form by clicking the tab at the bottom of this page. Your spot is secure once we have received your registration and payment. Any remaining balance is due February 1. See our scholarship and cancellations policy page for more information about payment. Enter the total below, and Click "Make Payment."